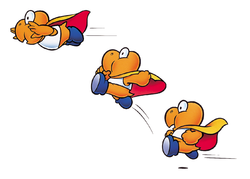 Super Koopas, also known as Super Koopa Troopas, are Koopas without a Shell that wear capes, allowing them to fly. They are found in the game Super Mario World, where they appear in Donut Plains 1, Butter Bridge 2, and Funky. They can be defeated by all attacks. Red shoes with yellow capes: They will swoop down when Mario approaches, and then rise back up. Green shoes with red capes: Same behavior as above, but are randomly generated enemies. They can also be summoned by two whistling Chargin' Chucks in Funky. Blue shoes with yellow capes: They start on the ground but will take off and fly continuously forward. Blue shoes with flashing capes: Same as above, but jumping on one will separate it from a Cape Feather, reverting it to a normal blue shoe-wearing Koopa without a Shell. Otherwise, all other attacks will instantly destroy them without providing the feather. There are no yellow-shoed Super Koopas just as there are no blue Winged Koopa Troopas. In the Game Boy Advance remake, a cutscene shown after completing all 96 exits shows Super Koopas with green shoes and yellow capes. Super Koopas get a minor role in WarioWare: D.I.Y. Showcase in the microgame Super Koopa, where they are based on their Super Mario World appearance. In this microgame, Cape Mario must dodge the aerodynamic enemies and collect some coins. Mantogame Manto is from the English "mantle" (as in a cape), and game is from ｢亀｣ kame, meaning turtle (as it has been compounded, the initial "k" consonant becomes voiced); effectively "Caped Turtle" or "Cape Turtle". During development of Super Mario Kart, one of the alternate victory screens featured a Super Koopa flying by and getting knocked over by the champagne bottle cork, but this was removed in the final version. ↑ 1.0 1.1 "Instead of the giant Cheep Cheep dropping the trophy on your head, in unreleased versions of the game there was a time when securing 2nd place would cause a Super Koopa Troopa to fly by and get hit by the champagne cork. Placing 3rd would result in four flying Koopa Troopas passing overhead, with the last one getting hit by the cork as well." - Playing With Super Power: Nintendo Super NES Classics eGuide, Super Mario Kart 16 Bits Tab. This page was last edited on April 22, 2019, at 11:32.